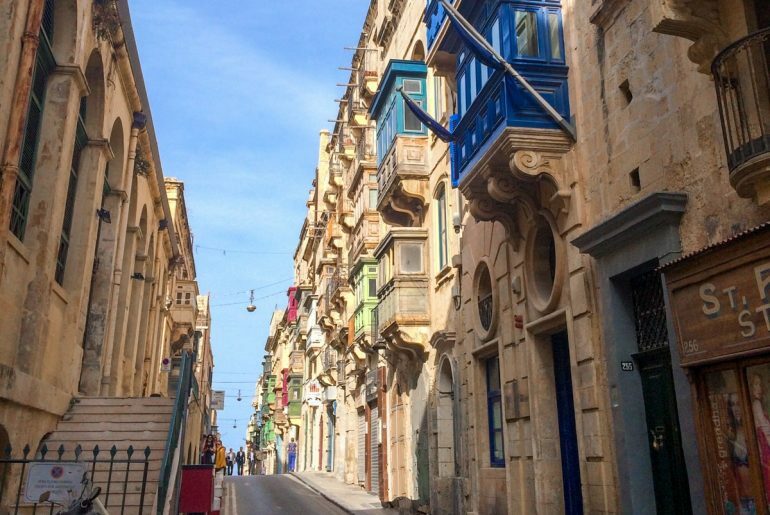 You’ll Love These Top Things to Do in Valletta! Oh, Valletta. You know, something about that city sticks with you when you leave. It’s Europe’s smallest capital, a UNESCO World Heritage Site, and wow is it gorgeous. Eric had the pleasure of visiting Malta on a previous trip with friends and they spent the week exploring the entire country. It’s easy to play tourist in Malta, and the capital city of Valletta is no exception. There are plenty of paid and free things to do in Valletta, as well as things to do in Valletta at night. 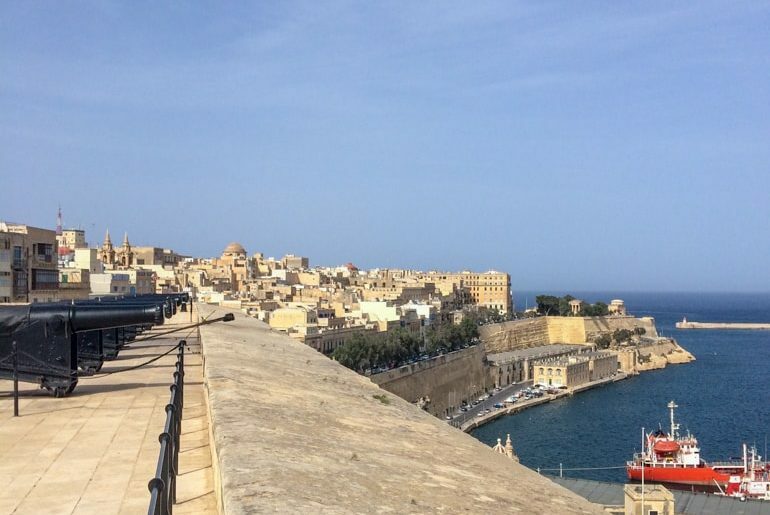 From shopping in Valletta to war museums and waterfront walks, Valletta honestly has something for everyone! 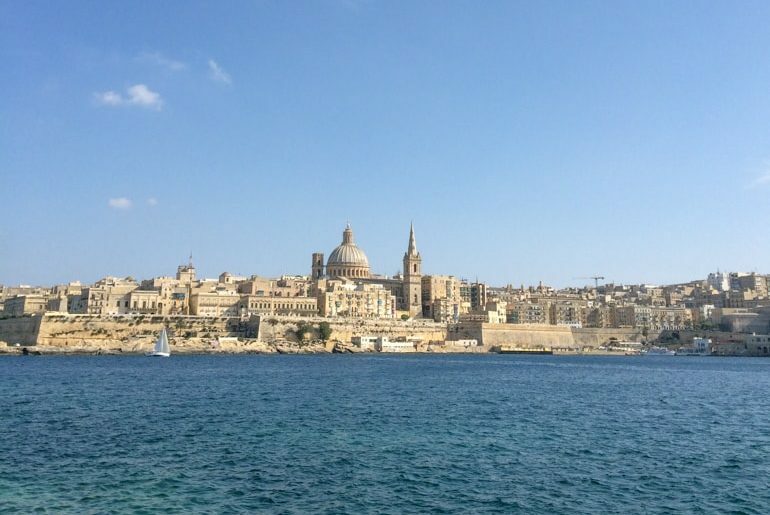 All things considered, Eric did quite a few of the top attractions and sights in Valletta so we figured we’d pass along the Malta travel tips and knowledge. Check Out Things to Do on Gozo and Where to Stay on Gozo – Malta’s Sister Island! While we have a whole hotel guide on the best areas to stay in Malta, you might consider sleeping in Valletta to stay close to the main attractions. This would be a good idea given the area’s popularity. Valletta is also well-connected by bus to the rest of the country making for easy exploring. So, you can check for top accommodations in Valletta here. 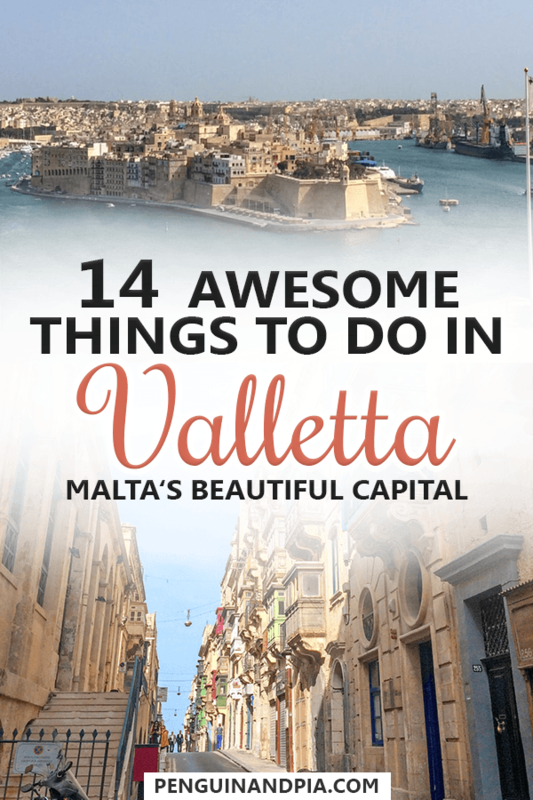 As for things to do in Valletta, let’s get started! The city itself is a UNESCO World Heritage site, and there is no greater entrance than to enter through the Porta Reale. Also known as the City Gate, the Porta Reale is where you begin your journey into exploring Malta’s tiny capital. Fun Fact: this modern version of the gate was built in int he early 2010s and is the 5th gate to stand on the same grounds. The coolest part is probably the grandeur of the entrance. You know that you are entering something cool and important (Valletta) when you walk up to it. Also, the gate itself is pretty symbolic of the contrast between the old and the new in this city. Valletta is a growing city with nowhere to grow so things modernize but they still keep the history at every corner. It’s a great city to explore as you will soon learn! Location: The southwest end of the city near the bus station and The Triton Fountain. 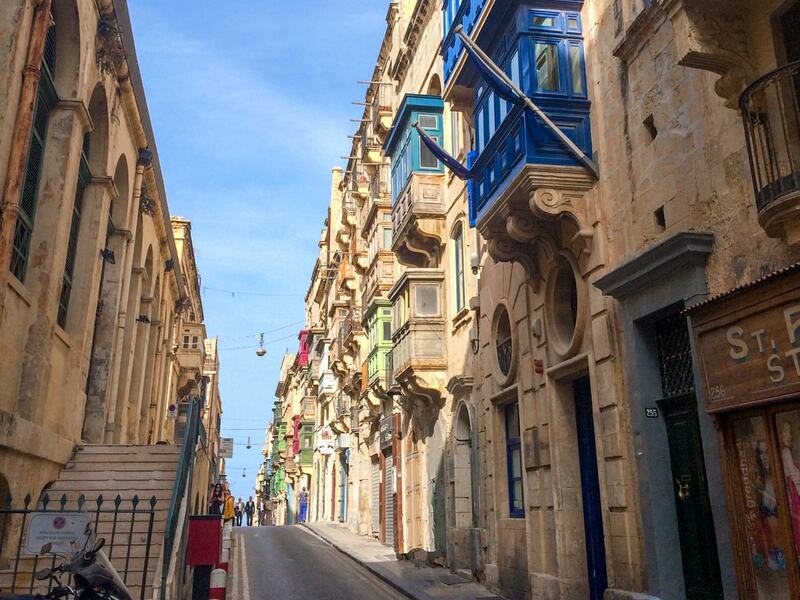 Simply wandering the narrow streets is adventure enough in Valletta. As with most cities we visit, doing a walking tour – free or paid – is usually a great way to get our bearings, get familiar with the city, and get ideas for things that we may want to check out later on in the visit. If you looking for a tour to book, this complete Valletta walking tour is a great bet and good value. If you don’t want to book a formal tour, you can always just wander around on your own. The city is a very long and narrow one so it’s difficult to get lost. If you do get lost, just walk until you hit the water and then you’ll be able to situate yourself to which side of the capital you are on! If you are planning to wander on foot yourself, you’ll find it helpful to know about one very long , central street in the capital: Republic Street. This one-kilometre long street starts at the City Gate and runs down the centre of the city lengthwise. The city was commissioned to be laid out in a grid by the Order of St. John’s after the Great Siege of Malta in the 1500s. Right after the Siege is when Valletta was actually established (1566) so the street became very important for administrative, judicial, and social purposes. Today, Republic Street is an amazing stroll to just get a feel for the city. You’ll find shops, cafes, restaurants, and end up passing main sights like New Parliament House (on the right JUST after the gate), the National Museum of Archaeological, and St. George’s Square (further down the street). At the end, you’ll pop out at Fort St Elmo (something we also cover below). The signature dome of the church is the tallest structure in Valletta. Even if you don’t observe any faith, checking out The Basilica of Our Lady of Mount Carmel is a must-do when you’re in Valletta. Also known as Carmelite Church, the original church was designed and built in 1570. Unfortunately, the church was badly damaged during World War II bombing and has to be extensively rebuilt. The church we see today was constructed starting int he 1950s and was inaugurated in 1981. Visitors can pop inside to check out the decorated yet more modern interior and have a peaceful chance to reflect while away from the busy city outside. You have to remain silent while inside! The Royal Opera House (Pjazza Teatru Rjal) or what is left standing there today, was a grand building completed in 1866. Located right on Republic Street on the right when you first enter the city, what you will see today are the ruins and a few pillars standing proudly into the sky. The original was damaged by fire in the 1870s but stayed standing. It wasn’t until 1942 that the Opera House was ultimately brought down due to German bombing. These days, the ruins are being used for open-air performances that are apparently quite the show given the venue and the atmosphere nestled within the historic city walls! If you want to learn more about upcoming performances, you can visit the official website. Funny enough, we walked by a bunch of times but didn’t realize what we were passing by (and its significance) until much later! The Grand Harbour is definitely a huge part of the City of Valletta. This one is a little bit of cheating since it’s not in Valletta… but around the city! 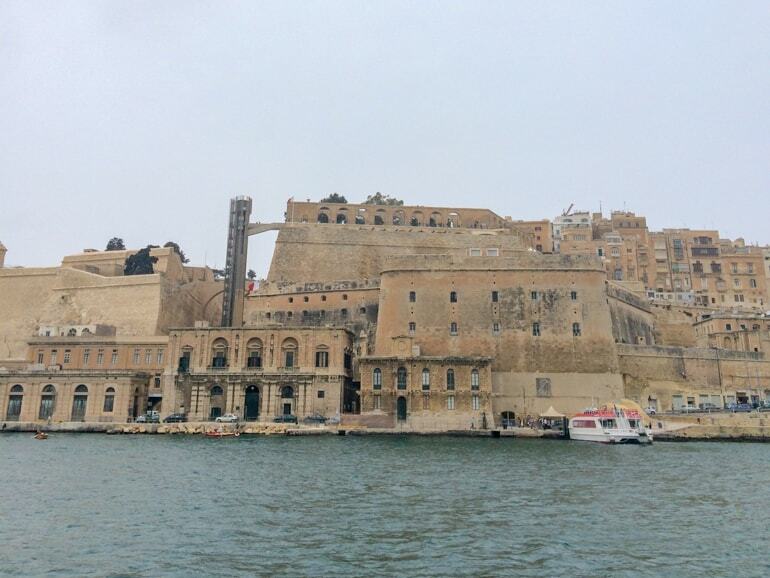 We also mentioned these harbour cruises in the Malta sightseeing post because learning about the naval history of the Grand Harbour (also known as the Port of Valletta) and seeing it firsthand from the water honestly was a great experience. You get to appreciate the city’s – and therefore the country’s – triumphs and struggles when you actually take to the water. It’s a seafaring nation with a deep connection to the water, so this makes sense. You can choose to see the two harbours that surround Valletta (Grand Harbour and Marsamxett Harbour) on a harbour day cruise or on a beautiful harbour night cruise! The Upper Barrakka Gardens and the Barrakka Lift to the left. One of the most popular things to do in Valletta is to visit the Upper and Lower Barrakka Gardens. Located to the right of the main City Gate, the Upper Garden is this beautiful area stone archways, monuments and historic plaques, and well-groomed green space perfect for photos and enjoying the sun. The Upper Garden is located directly above the Saluting Batter (mentioned right below) making it a great spot to hear the cannon fire each day. The gardens are open to the public and free to enter! The greenery at the lower right side is the Lower Barrakka Gardens. The Lower Barrakka Gardens are located towards the end of the peninsula on the same side of the Upper Gardens – about a 10-minute walk away and a bit lower down in elevation closer to the water. Also open to the public and free to enter, you’ll find beautiful gardens and a few notable things like The War Siege Memorial. The guard getting the cannon ready to fire! Very close to the Upper Barrakka Gardens (just a level below the gardens, in fact) you can’t miss the cannons lined up in formation and the beautiful green grass. This is the Saluting Battery, which is now a historical war museum with exhibits and daily live cannon fire! 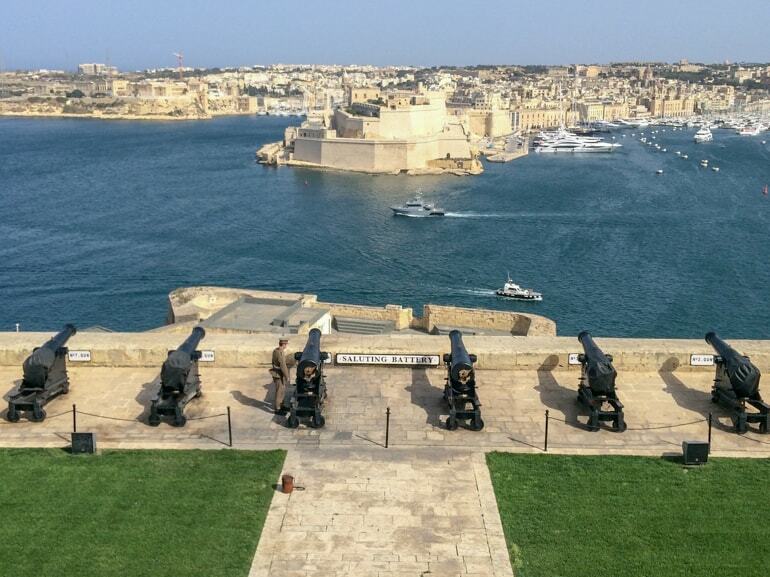 The Saluting Battery was first built back in the 1560s around the time of the Great Siege of Malta. In short, Turks (Ottoman Empire) tried to take the island and the Order of St. John fought them off. Go, Malta! These days, the cannons fire at noon and 4 pm so choose your time and make sure you are early to get a spot along the rail! You can also go down below to check out the exhibits which Eric is pretty sure he paid for but isn’t sure if it was part of his visit to the Lascaris War Rooms (which are the next activity). So if you are confused, check out the website to learn more but don’t be afraid to just ask when you are there! 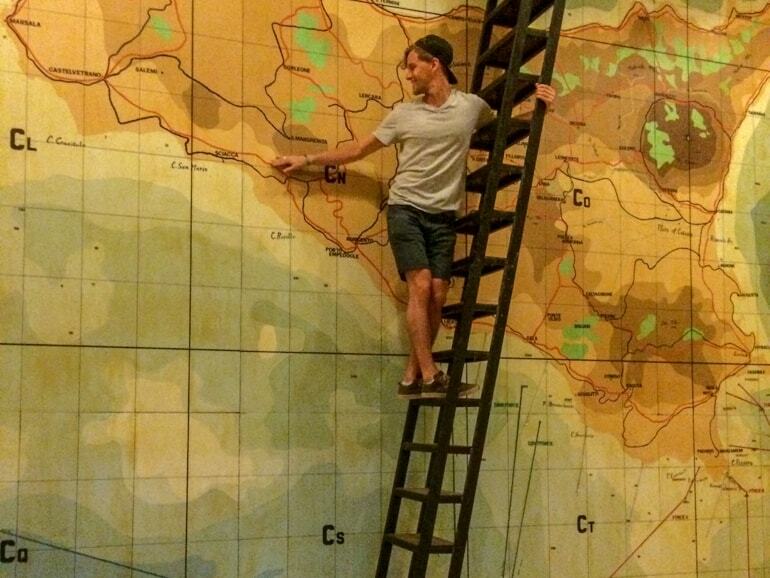 Eric playing war coordinator and pointing to things on the giant wall map! If you are interested in Malta’s history and the role the country played in World War II, then you should definitely check out the Lascaris War Rooms. Built in the early 1940s, these underground tunnels served as a command post for the Allied Forces. There’s a museum and guided tour that you can pay to go on. The museum is comprised of the underground rooms and tunnels that were actually used for the defensive strategy in World War II. This was easily one of Eric’s favourite activities on the whole trip because it was just so interesting and well worth the entrance fee. In fact, he did it on his last day! If you want to learn more about the Lascaris War Rooms, visit the official website for tour times and prices. Location: Beside the Upper Barrakka Gardens, on a slightly lower level. Located on Republic Street, you will walk right by the beautiful Baroque building that houses the National Museum of Archaeology. In fact, it’s not too far from the City Gate once you enter Valletta. The museum itself is housed in the Auberge de Provence which was built back in 1571! The museum is great because you can see artifacts that were taken from some of the most important sites around Malta. These sites include the from Ħaġar Qim temple complex (which we mention in the Malta Sightseeing post). Usually, we don’t get too excited about civilization history but Malta is absolutely crawling with fascinating Neolithic-era history (that is around 6000 years old). You can find prices and information for the Archaeology Museum on the Heritage Malta website. If you walk as far as you can go on Republic Street from the City Gate, you’ll reach the tip of the city. 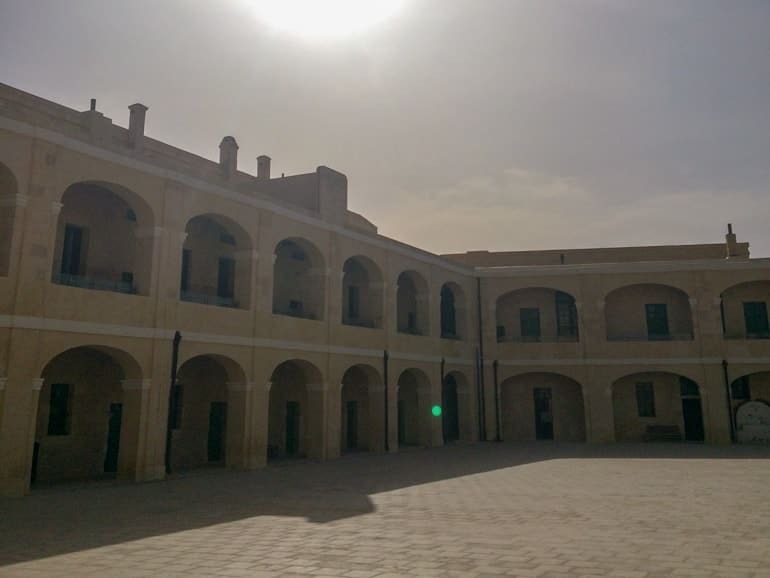 Here, you’ll find Fort St. Elmo – a star-shaped fort that played a huge role in that Great Siege of Malta back in 1565. These days, you can enter the Fort and check out the National War Museum which is housed inside. Eric and his buddies paid to go inside and had a great time exploring the fort. The exhibits are really interesting and divided by historic timeline. You can see weapons and armour from the medieval time all the way to artillery and items from the most recent World Wars. Overall, the fort was a great experience and if nothing else offered great sea views from the perspective of a “protector of the harbours” around Valletta. Pretty neat! 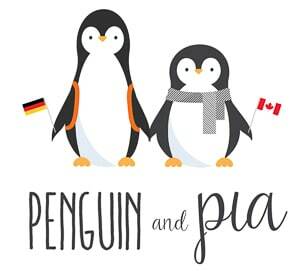 If you are interested in visiting, adults prices are 10 euro (but its worth it, we feel). Check out the website for more information. As the seat of the Office of the President of Malta, the Palace – as it is also called – continues to play an important role in Malta! The Palace itself was one of the first buildings constructed in the city after the Great Siege. Over the centuries, the island saw a change of many rulers and these rulers all had a part to play in shaping Malta from within the Palace walls! You can visit the Palace State Rooms and check out their lavished interiors. Over the years, the Palace has become a hub for rare art pieces from paintings to tapestries and fabrics. As such, a visit is more like a walk through a well-curated art museum than a government/parliamentary space! If you want to check out the Palace, you can learn more about the prices and opening hours. Just remember that the entrance to the Palace is along Old Theatre Street! Feel adventurous? Head out to Breakwater Bridge for a breezy stroll. If you want to experience the Grand Harbour from a completely different angle, you might consider going for a long walk to cross Breakwater Bridge. 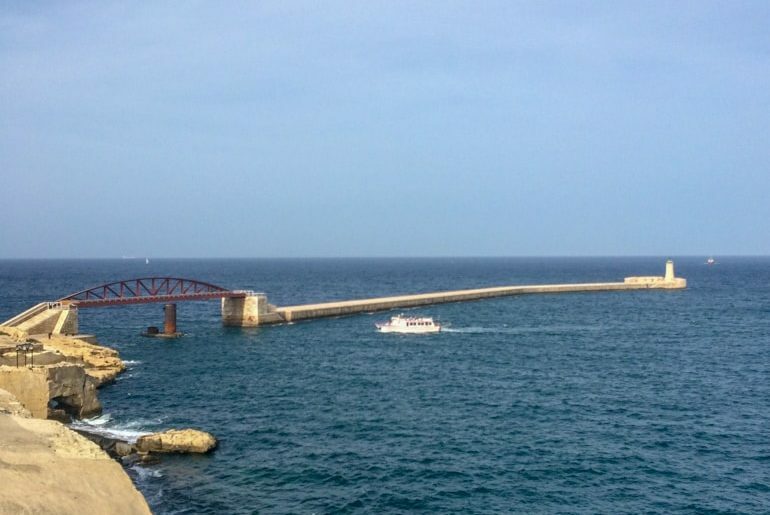 Located at the entrance to the harbour extending out from Fort St. Elmo, the bridge and breakwater barrier form a walkway which ends at a small lighthouse – St. Elmo’s Lighthouse. You can learn about the history on a harbour boat cruise but basically the Italian Navy destroyed the original bridge during World War. The new iron bridge stands in its place. Getting there is no easy feat – as you have to hug the shoreline below the Fort. It can be confusing to get there but aim for the Lower Barrakka Gardens and the Malta Experience. Once there, you’ll find rough steps down to the shoreline and a path to follow towards the end of the peninsula. Eric’s friends looking at the grandeur of the cathedral. 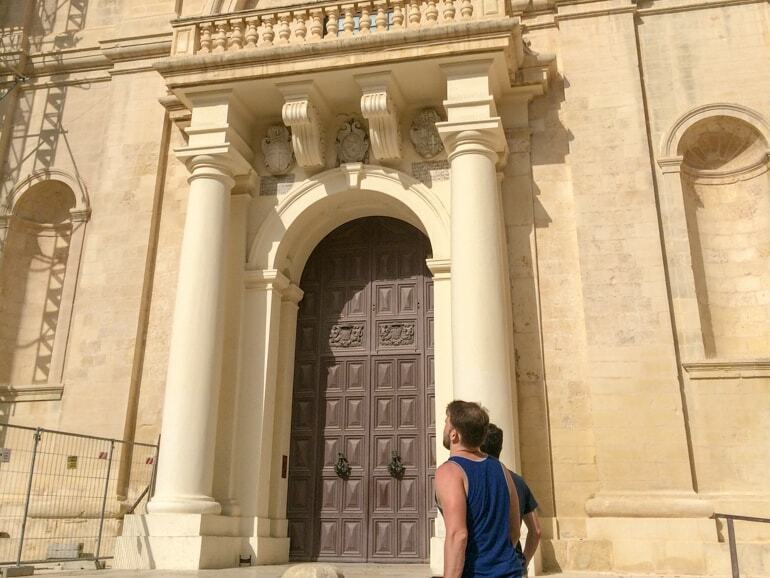 One of the most famous attractions in all of Valletta has to be St. John’s Co-Cathedral. Located right int he middle of the city, the church was completed in 1577. This makes it a church that was built as the city was growing shortly after its founding! The biggest difference with the church compared to other buildings in the city is the Baroque architecture style used. Typically, this style isn’t seen in buildings (built this early) with the exception of a few other buildings. You have to pay to enter but the audio guides are free and come in MANY different languages. You’ll want to stop inside – the interior is absolutely beautiful. To learn more about opening hours and prices, visit the official Cathedral website. 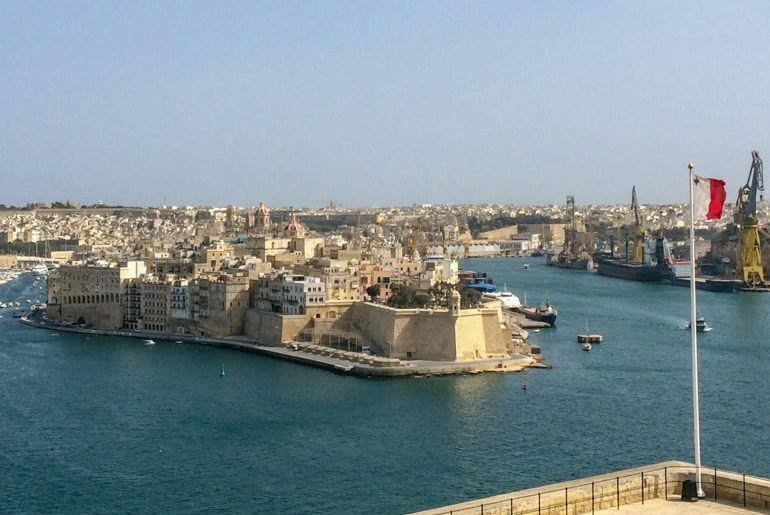 And there you have it – 14 of the best things to do in Valletta! Obviously, there are a few more things you can check out in the city. That said, we wanted to cover the main ones and a few you might not have thought of! As we said, there is so much to do in the capital that you can spend ages just exploring. We love Malta and hope that you can get the chance to explore the country someday soon – and hopefully this post helps you on your journey!